Praise dancewear, worship dance attire, Dance Fashions Warehouse, worship dance dresses, praise dance dresses, christian dance wear, mens and boys praise wear, praise tunics, praise overlays, liturgical dance dresses, worship pants, worship tops, flamenco dresses,spirutial dance wear, cheap praise wear in Atlanta. - Bunion Buster. 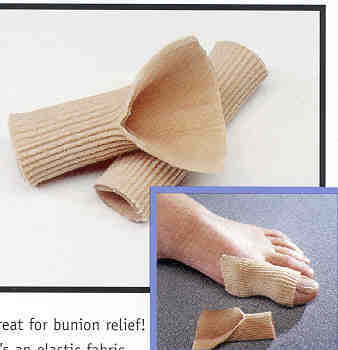 GREAT FOR BUNION RELIEF. IT IS AN ELASTIC FABRIC TUBE WITH A GEL COATING ON THE INSIDE FOR THE BIG TOE AND BUNION AREA.